Wow! I am feeling a little teary eyed about this post, (a happy tear I might add.) Five years ago, November 1, 2005. I opened the doors of The Material Girls Quilts. It was a dream come true. I couldn't have done this without my awesome hubby Tom and my 2 amazing kids Shelby and Parker. They have put up with an absentee mom, a messy house, and Tom cooking a lot of "Hamburger Helper" I have been truly blessed with the most amazing family and friends, I love you!. 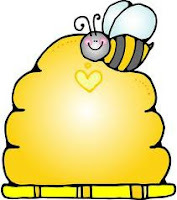 You, my customers and friends have watched me grow, cry, laugh, and have supported me through it all. I wouldn't be here if it weren't for you!! Thank you all for supporting me, and my shop!! You are the bestest! 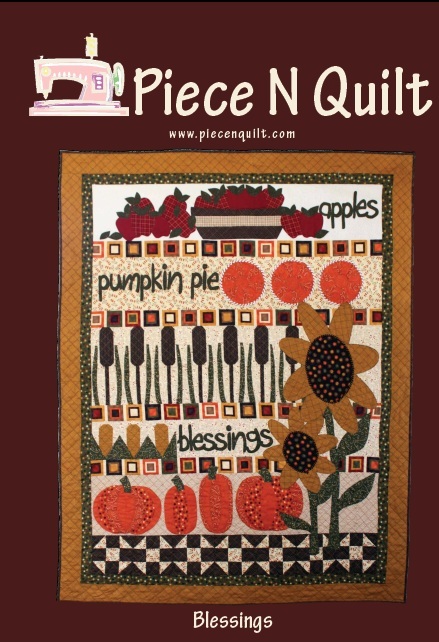 Quilt Aid USA 2010. What is it you ask? Six shops have joined together with 12 of the top designers from Australia and the US. Each shop will offer 2 blocks specially designed for you to purchase, our 2 blocks are designed By Bari Sue Gaudet of Bareroots & Bronwyn Hayes of Red Brolly Choose your favorite finishing kit from on of the selected shops to create a special quilt celebrating "Heart and Home"
A portion of sales from every pattern will be donated to the Addis Ababa Fistula Hospital in Ethiopa through the Hamlin Fistula relief and Aid Fund. I have to tell you I love this girl!! 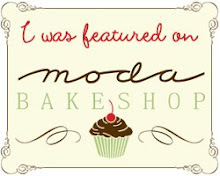 I found all of her fantastic designs on Moda Bake Shop Meet Natalia Bonner of Piece n' Quilt she is so cute! This is her newest design "Blessings" We have the quilt hanging in the shop and it is so cute!! 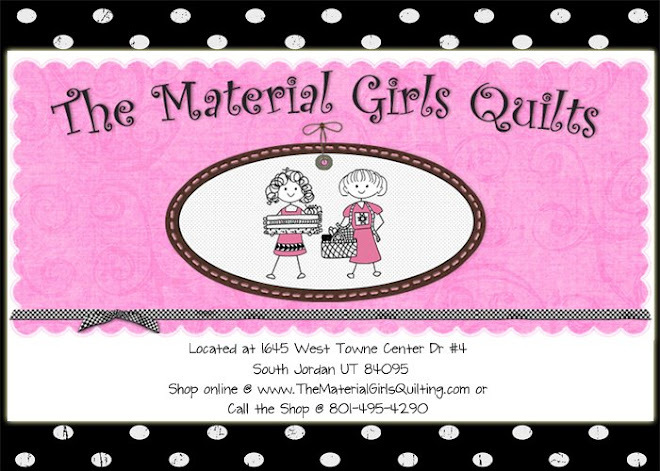 Pop on over to her blog and tell her Material Girls sent you!! We are re-building our web page so if you would like to order this just give the shop a call (801)495-4290. Parker, Shelby and Zane before a Jazz game! Tonight we are going to dinner with Shelby's boyfriends parents. He is getting ready to leave next week for a mission for the Church of Jesus Christ of Latter Day Saints for 2 years to Bogata` Columbia. Zane has hung around our house for a few years now, but I could never call him her "boyfriend" but now I can (I know, I don't understand the whole thing either). He is a great young man and is going to be a fantastic missionary!! We are truly going to miss him, I get teary eyed just typing this. He has stopped by almost all of our late sews at the shop and has seen some of the Woodraska's at their worst! 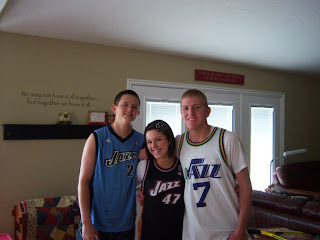 (I guess I can stop wearing the BYU t-shirt he got me!) Zane we love you and are so proud of you! I will probably lose weight while he is gone because every time he comes over he brings me a treat in the form of gummy savers. Zane your the best!! PS. I have to give kudos to his mom and dad they raised a fantastic son!! 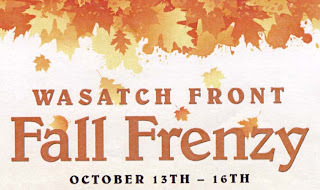 Mark your calendars ladies, the Wasatch Front "Fall Frenzy" is starting on Wednesday Oct. 13. thru Saturday Oct. 16. This is the "Fall" party to attend my friends. 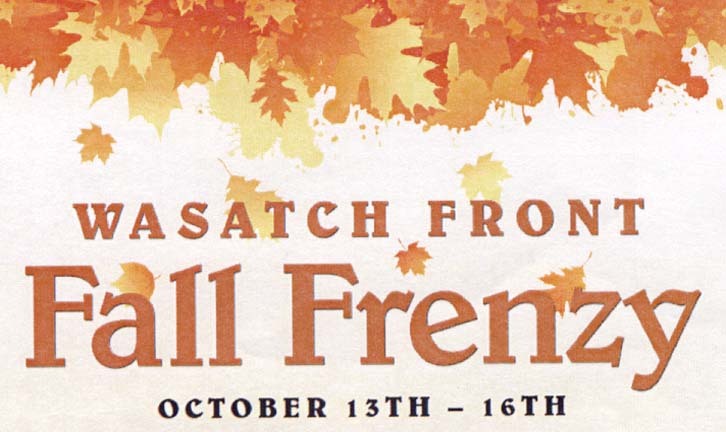 Fifteen shops with a chance to win $3000.00 in gift certificates, games, stop by a pick up your free pattern, and a whole bunch more! ﻿I am not sure how I get so behind but I do. I should have had this posted in the wee hours of the morning that I am having a Giveaway!! Yes, you heard me I said Giveaway! 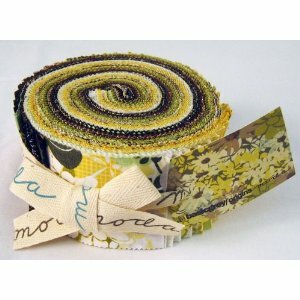 I am giving away 2 thats Two Origins jellyrolls to two lucky winners! (You must be a follower of our blog or become one) Then hop over to http://www.mygiveawaytoday.com/ and read all the details. They will be choosing the winner and I will be choosing a winner but I will pick from our followers! So good luck girls and have fun!